I had no idea what to make today so I pulled out a stack of cookbooks, sat on the floor, and flipped through pages hoping to be inspired. The lucky recipe source turned out to be a marble spice cake from The Methodist Cookbook circa “unknown” from St. John’s Methodist in Richmond Texas. I liked this book from the moment Todd plopped it on the table at Valentine’s Day. It’s got a huge dessert section and everything is from scratch. Plus, some recipes don’t have actual measurements, just instructions like “add enough flour to reach cookie dough consistency” or “bake in a moderate oven” with no actual temp listed. People seemed more confident about baking back then, that’s for sure….whether they liked it or not. Here’s a picture of the book….it sort of makes it look like it’s from the stone age, but you get the idea. So maybe what attracted me to this cake was that it had an oven temperature. Mrs. C.D. Myers was kind enough to say 350 F and her directions, including how many times to sift, were pretty clear cut. The cake turned out delicious and has an amazing tight crumbed texture which I attribute partially to the fact that I didn’t hack my way through it but followed the steps with precision and didn’t side-step the sifting. Plus, I used cake flour and weighed it out. This cake was so interesting that I did some Internet searches to see if I could find a similar recipe. The closest I came was a recipe from this sweet little blog (great new find for today!) 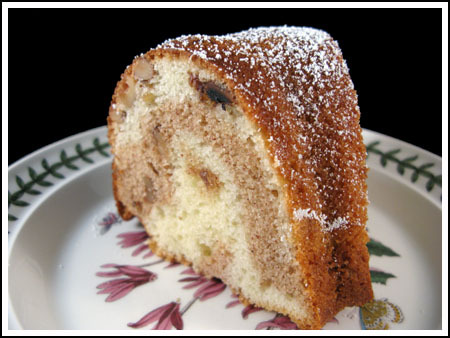 called Marble Spice Picnic Cake. It’s almost the same as my Methodist recipe, but scaled down and baked in a different size pan. Another clue to the cake’s origin came from Nick Malgieri who says he found his marble spice bundt cake recipe in an old cake flour booklet from the thirties. He made major adjustments to where it’s not even the same cake, but I’m thinking the original recipe from that cake flour booklet might have been this one. Preheat oven to 350 or if using a black Bundt pan, 325 F. Spray the 10 inch Bundt pan with flour-added Pam. Sift the sifted flour once, then sift again with the baking powder and salt. Beat the butter and sugar for about 5 minutes or until super creamy and smooth. I used my stand mixer for this. Scrape side of bowl and add the eggs one by one, beating for at least 30 seconds after each egg. Mix together the milk and vanilla. Add the flour mixture and milk mixture to the batter alternately in 3 parts, starting and ending with flour. Beat on medium low speed until smooth. Pour half the batter into a second bowl (about 3 cups) and stir in spices, molasses and nuts. Layer the two batters in the Bundt pan, alternating between the two. Bake on center rack for about 55 minutes or until cake tests done. Let sit for 10 minutes, then turn from pan. I tried this cake friday and everyone loved it! the only change I made was I left out the walnuts. The swirl came out perfect I was proud 🙂 thanks for another great recipe! that truly does look so good. Beautiful cake! I recently inherited two boxes of old cookbooks & pamphlets from food & appliance mfrs. & utility cos. from an elderly relative who moved to a retirement home. They too have some recipes that require quantity guessing. Aren’t these relics fun? I love that you included a pic of the cookbook. 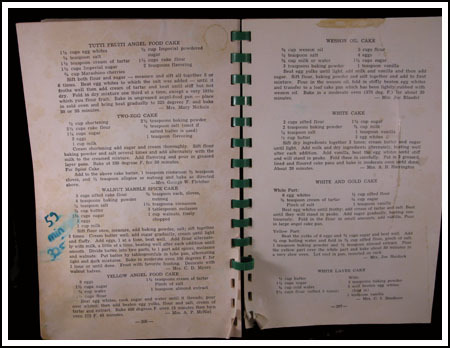 I remember that growing up we could easily find our family favorites in the cookbooks because they were spattered with food and crispy. 🙂 The cake looks great too. Yum, Anna! That cake looks amazing!